Leave a Comment on Get my gluten free cook book for 99 cents thru October! 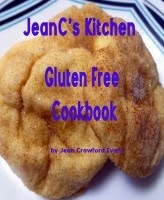 JeanC’s Kitchen Gluten Free Cookbook. Buy it today at Smashwords for 99 cents (half off). Use coupon code DB63Z at check out. Offer expires 11:59 pm 10/31/16.